Northrop Grumman Corporation recently announced that it has finalized a Cooperation and Research Agreement to work closely with Airbus on the Wing of Tomorrow program. The three-year agreement expands the current Northrop Grumman relationship with Airbus and explores complex composite wing stiffener forming automation with out-of-autoclave material systems through an investment in equipment, test articles and engineering support. This relationship positions Northrop Grumman for future potential high-rate production opportunities. 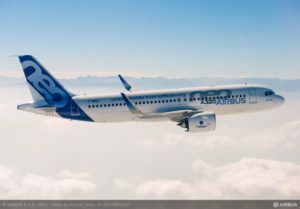 Northrop Grumman finalized a Cooperation and Research Agreement (CRA) with Airbus on the Wing of Tomorrow program for future potential high-rate production opportunities. New material experimentation represents a major part of the program, and lower-cost composite technologies currently being pursued could enable wing components to be produced with significantly reduced equipment and tooling costs, along with enabling a faster production cycle. Increased use of composite materials also opens up new possibilities in terms of wing configuration and construction. Read more…..